Gnome doors, Fairy Doors, Faerie Doors, Elf Doors, 9 inch. 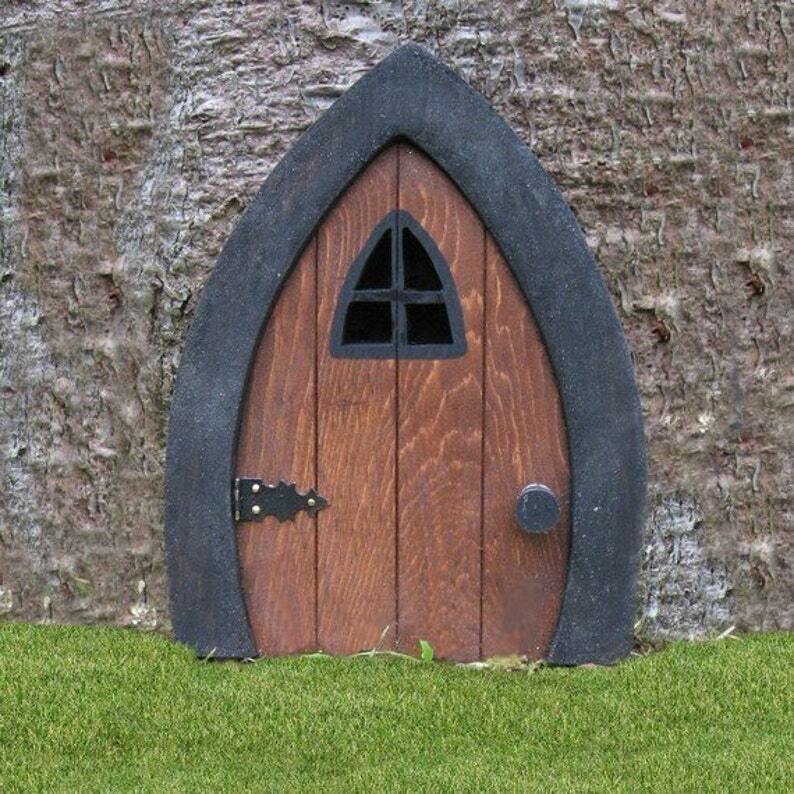 You are commissioning me to construct a wonderful gnome door / faerie door for the Wee Folk in your garden or home. Please note: Because this item is hand made, the one you receive MAY vary slightly from the one in the picture...but will essentially look the same. If you select the variation of this listing for the door that opens, the door will have a 2nd hinge to facilitate that. These doors also look great against the skirting of a house, or even on a shelf. You can easily attach the door to any surface using the keyhole slot on the door's back panel. I will happily combine shipping on multiple orders and any excess shipping you pay is reimbursed when your package is mailed. If you wish to order multiple items and would like me to create a listing that includes your items with a combined shipping charge, just convo me and I will be happy to do so. Please allow me up to 2 weeks to have construction finished and the item packaged and ready to mail! This is a good faith estimate of time needed to make your item. Depending on how busy I am, it might be quicker, or it could be a bit longer. Convo me if you're concerned about meeting a specific deadline. Gnome doors, Fairy Doors, Faerie Doors, Elf Doors, 9 inch - colored. Fairy Doors, Faerie Doors, Gnome doors, Elf Doors, rounded. Faerie Doors, Fairy Doors, Gnome doors, Elf Doors, Hobbit Doors 9 inch with leafy green frame. Gnome doors, Fairy Doors, Faerie Doors, Elf Doors, 12 inch, lion knocker. Faerie doors, Fairy Doors, Gnome Doors, Elf Doors, 5.5 inch. This sweet Gnome door is adorable! Very well made and shipped fast. Thank you! Great fairy door! I only wish it had a way to hang it ( holes for screws) and that the back of the window was made of wood, not felt. Will have to replace it before it goes outside. Very cute though. Excellent craftsmanship! Was exactly what I was looking for. Arrived in a timely manner. Owner very helpful with questions I had. Everything was perfect!!! Love it!!! ***PLEASE PLEASE ensure the address you enter on your order is correct. Time does not permit me the luxury of manually verifying or changing addresses. If your address is correct, notify me and I will cancel your order and you can resubmit with the correct address. Your complete satisfaction is very important to me. I work very hard to ensure each piece I craft meets, and hopefully exceeds, your expectations. Because all my pieces are handmade, there may be slight variations in the piece you receive. For example, the wood stain may look slightly different, or the accessories used to decorate the piece may vary slightly. If you are not satisfied, for any reason, with your purchase, don't hesitate to contact me. I ship via Canada Post and all packages are insured up to $100. Additional coverage is available at $1 for every $100. Tracking is NOT available on "small packets US" or "small packets international". If you wish to have tracking, advise me BEFORE purchasing and I will let you know a shipping rate for a "tracked" package to your location. Shipping from Canada to the US can take 2-3 weeks on average (and sometimes up to 6 weeks). Shipping from Canada to overseas destinations can take 3-4 weeks on average (and sometimes up to 8 weeks). Gnome doors, Fairy Doors, Faerie Doors, Elf Doors, 5 inch. Faerie Doors, Fairy Doors, Gnome doors, Elf Doors, Hobbit Doors 9 inch with leafy green frame that OPENS. Middle earth Hobbit door, fairy door, faerie doors, elf door.